Have you ever wondered where do the bumblebees visiting your garden come from? How far do they travel from their nests? How can scientists find this out? It would appear that an obvious strategy would be to mark bumblebee workers from single nests, survey the surroundings of the nest and map where they go. In practice, this proves difficult as it is difficult to find enough marked workers in a reasonable amount of observation time. Another option is to mark bumblebees, release them at increasing distances from their nests and see how well they return home. When this last experiment was performed bumblebees -Bombus terrestris in particular - could return home from the astonishing distance of 9.8 km! However, this does not show how far from their nest they normally forage. In this paper, Mairi Knight and co-workers used an elegant, sophisticated, but cost-effective approach which yielded a lot of data. The premise of their work is that the workers from a nest are expected to be full or half sisters - offspring of the same queen. What they did is to follow a linear transect capturing workers of four common bumblebee species at regular intervals. 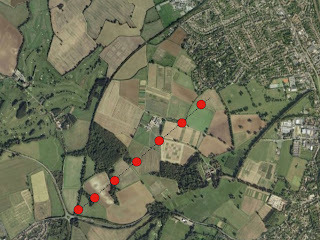 The sampling design: across agricultural land, with some woods, hedgerows, and a nearby town in Hertfordshire. The sampling points (in red) are approximately 250 m apart. They screened the workers using 8 to 9 very variable genetic markers (microsatellites, which are also used in human paternity testing) and identified sisters by assessing the number of markers sisters should be expected to share. Their results were then used to calculate the maximum foraging distances of nestmates of the four species. It was 449 m for B. pascuorum, 758 m for B. terrestris, 450 m for B. lapidarius and 674 m for B. pratorum. Quite a long way, I would say. B. terrestris is the species flying longer to forage, and also the species with the larger workers and more workers per nest. A much more striking result of this study, though, is the number of nests from which workers come to feed in a specific sampling point. Knight and coworkers estimated that, on average, B. lapidarius workers came from 75 different nests to a specific sampling point, these figures were 43 nests for B. pascuorum, 52 for B. terrestris and 37 for B. pratorum. Of course this study applies to farmland, but for B. terrestris, nest densities might be even higher in urban areas. It makes me feel good to know that even when, frustratingly, there are no bumblebee nests in my garden, it still supports a very high number of nests from a range of species. Thank you Jane! 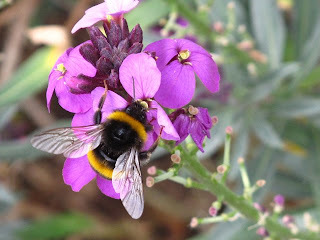 My garden is buzzing with bumble bees now, it's so nice they work whatever the weather!